I just want you to know that Ivan came over to our house on time and did a fantastic job on our fence and electrical outlets. He worked hard on the fence in attacking the problem of the tree roots lifting the fence. He dug and cut the roots so the fence when fixed would be fixed for good. He was a pleasure to work with (as per my wife Suzanne) and we look forward to having him come back again when we require further work. In an era when it is really hard to get things done promptly, with expertise, and at a reasonable price, enter WeHoneyDo.com. I was so pleased with the work that they did that I am looking for additional projects for them to do. The inspector of my home (sent by the buyer) kept commenting on how well the home repair work was done and asked for the company's contact information! I could not have been more pleased with the service provided and offer my highest recommendation to anyone who needs home repair. You may want to use these after shots for your files! Thank you! You, Marco and his team did a fantastic job. Thank you it was pleasure working with you! WeHoneyDo.com isn't just catchy. I called on short notice, got help with an urgent issue right away, and was very impressed with the level of knowledge and skill of the expert that was sent to help me. Now that I've also had a chance to meet and get to know Eric (thanks to Biznik), I highly recommend his company. They really do seem to be able to "do it all." Just called, and Eric is sending Tom to the condo tomorrow!! He is as quick and on top of "it" as you are, Carmen! Thanks again for the reference! Just wanted to let you know that we are very pleased with your reference for an electrician. Tom was prompt in getting over to see us and our needs, and then to schedule a time to do the work that was convenient. His employee, Ivan, arrived on time and did the job in less time than Tom had calculated, tho he'd suggested it might be done in the shorter time. We are pleased with the works, and delighted with the difference our having overhead lighting put in has made in the three rooms that were done. So - we can now see MUCH better in those rooms, and especially into the closets in the bedrooms. 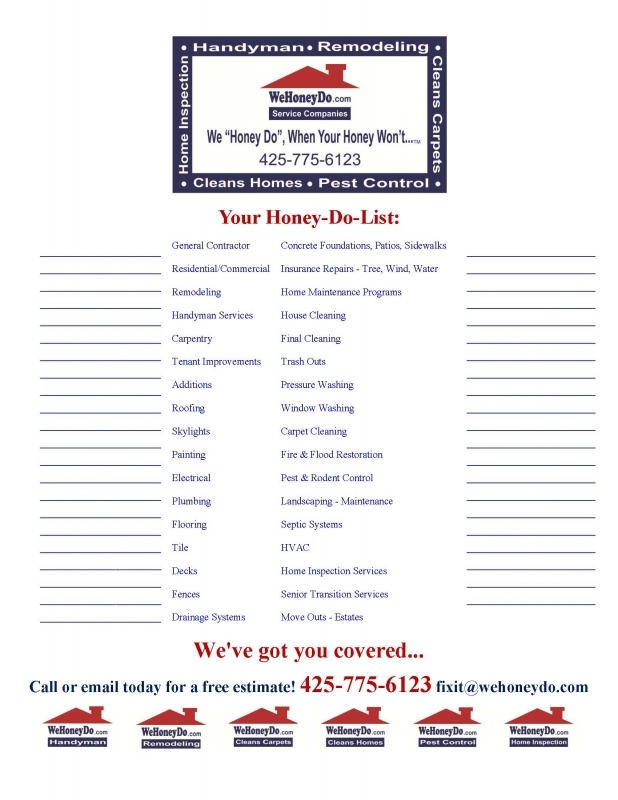 My "Honey-do" list has been keeping John busy, but we are starting to get to the end of it - at least for the time-being! Mark Herring posted on your Wall. "Thanks for that fast turn around on that stucco quote...you guys rock!" Diane Gordon commented on your photo. "You are awesome!! I called & in a short time your partner came out to help resolve a problem with the buyer. Mark was professional, efficient and helpful! Thank you! I looked at the repairs to the little house up in Greenwood and your guys did an excellent job. I can’t remember Steve’s last name but he came out to help me knock off a list of things (he worked 4/21 & 4/22). I just want you to know he was fantastic. He was prompt, super helpful, fast and an overall life saver. I’ll be calling to have him come again soon! !